The short answer is, no, of course, nothing can save Yahoo. A year from now things will certainly look very different in Sunnyvale. The problem is that it’s really tough to have a consistent voice at Yahoo’s scale. You need something that speaks across the spectrum of Yahoo’s audiences — it has to be recognizably Yahoo and at at the same time talk natively to readers of Yahoo Style, Yahoo Parenting and Yahoo Fantasy Sports. There are two ways to do this: One is to follow the verticals route that so many places like Vox, Gawker and Conde Nast have done so well — create distinct properties with distinct voices. This is an obvious path for Yahoo, and one the company started down a couple of years ago with its “digital magazines” initiative. But creating new brands is expensive and takes a lot of time the company doesn’t have. An even bigger problem is that Yahoo already has a brand association, and it’s not anywhere close to what the company wants it to be. That is, are you more likely to read style coverage from “Yahoo Style” or Vogue? The other way to address the voice problem is to change the expectations around the experience you’re providing. That is, if you think of Yahoo as a big platform that hosts a lot of editorial content for people to consume, it’s a hot mess. But if you think of Yahoo as a tool that people use to interact with a wide variety of content from professional providers and other users, it gets a lot more interesting. In this scenario, Yahoo isn’t an editorial entity so much as a venue in which a lot of voices interact. The problem here is that to be a great platform for users, you need to provide a great user experience, and in digital media that means, fundamentally, giving users a presence in the operation. The best and most successful media content companies out there — YouTube, Facebook, Instagram, Snapchat, Pinterest, Twitter, etc. — all provide experiences in which a user is both a publisher and consumer of content. If you want to know how editorial can work at scale in digital media, this is it. In all cases, the common thread for all these platforms is that users and consumers of content are also publishers of content. Tumblr at its best is a really great venue for consuming and publishing content. The Tumblr dashboard is a really nice environment for this; it works great on mobile and allows a higher degree of interaction than anything Yahoo currently possesses. Here’s the part where I say that, yes, I know Yahoo’s “digital magazines” are built on the Tumblr platform. But the only way I know this is because of the press around the product. Because if you look at the actual pages of these digital magazines, there is no way of telling that they are built on the Tumblr platform. Worse, those pages don’t provide any entry points to the Tumblr platform — it’s virtually impossible to follow, say, Yahoo Style on Tumblr. This is a huge mistake for Yahoo, and fixing it could revolutionize the company. That’s because no company that currently produces a lot of great editorial in house also provides a great user experience. Yahoo could be the first; it has the assets in place. Here’s what’s wrong, and how to make it better. 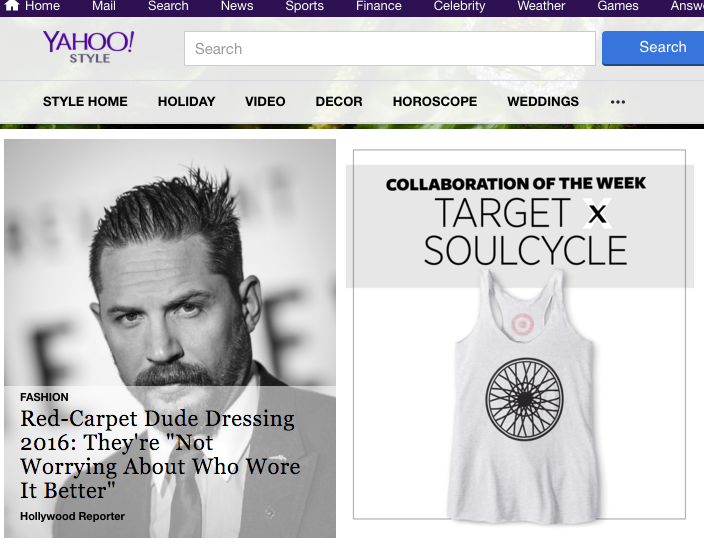 Yahoo Style Editors: Our current CMS is crap. Let us buy or build a new one. Marissa Mayer: Dudes, I just spent one billion American dollars on Tumblr. Use that. Your content creation area is relatively small, you don’t have anything in the way of layout options (yes you can use Markdown, etc., but that’s not an answer if you want to be a real CMS that busy journalists can use), and God help you if you lose your Internet connection — there’s no autosave feature, and you can’t keep track of versions. Tumblr is not a good tool for the creation of longform articles. And it’s not great for creating the kind of photo galleries that are the bread and butter of highly-visual sites like Yahoo Style — at least not in the way that Yahoo currently uses Tumblr. 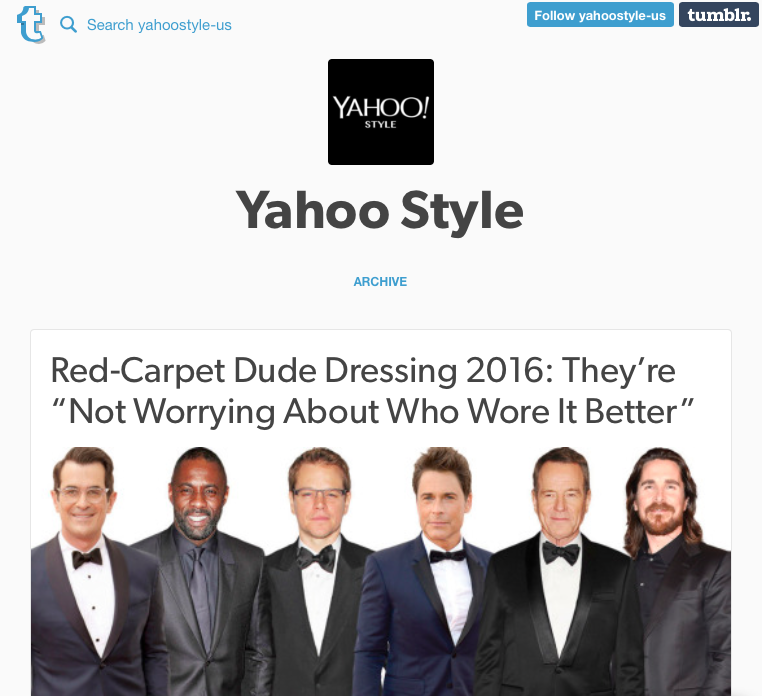 What Yahoo has done with their digital magazines is take Tumblr content, reformat into a way that displays in a more conventional format, and in the process lose much of the benefits of using Tumblr in the first place. The thing is, Tumblr can be a great platform for content — if you use Tumblr the way core users of the platform do. That means short form stories, photo-driven content, and liberal reblogging. Mistake No. 2: Tumblr is a Conversation Platform, not a Broadcast Platform. What we’re left with is a tough mismatch — Yahoo’s digital magazines use a publishing tool that’s ill-suited to what it wants to do, and doesn’t take advantage of the real strengths that the tool does provide. A fundamental disconnect Yahoo needs to reconcile in using Tumblr to power its digital magazines is that few of them cover topics that are of prime interest to the majority of the existing Tumblr community. And those that do don’t cover those topics in a way that resonates with the Tumblr community. One way to solve this problem, and it’s the way I see a lot of legacy media players approach Tumblr, is to say “GIFS! That’s what the kids today like!” and program accordingly. This can work, but it’s limited, and can be kind of sad. A better approach is, again, conversational: Be a member of the community of users, not just a broadcaster to that community. Observe how the good players in that space operate, take advantage of the fact that, since you own Tumblr you should know more about its metrics and how content works on the platform than anyone else in the world, and tailor your approach to that. That said, Yahoo can grow the Tumblr community, by creating good content and expanding the definition of what works on Tumblr. While Tumblr has, either consciously or by default, become a network for teens (More than one person has described Medium as “Tumblr for adults,” and there’s a lot of truth to that), Yahoo provide use cases and introduce Tumblr to a whole new kind of user. This is crucial for Tumblr’s long-term prospects; while there’s nothing wrong with being solely for teens, that’s not a particularly secure position in the marketplace. Mistake No. 5: Yahoo isn’t doing anything to bring more users into the Tumblr ecosystem. This is the biggest missed opportunity of the Tumblr deal. With their digital magazines, Yahoo has tens of millions of people looking at these Tumblr pages every day…and they don’t know that they’re Tumblr pages. It’s as if Yahoo had bought Twitter and decided to produce Yahoo Style as a page of Twitter Cards, with no way for anyone to actually use the functionality of the service (come to think of it, this is kind of how Twitter Moments works, but that’s another story). Yahoo’s business model has always been a conventional publishing one — assemble a big audience and sell advertising around it. The best version of Tumblr’s business model is an evolution of this — assemble a big audience and bring advertisers into the same system, using the same tools as any other user to reach an audience. That’s a model I still very much believe in. For one thing, it very neatly sidesteps the adblocker issue, since the ad platform is the same as the content platform. And it provides the potential for better brand advertising than a banner format allows. The thing is, Tumblr’s business model is very much dependent on people using Tumblr. There’s a a few side businesses to be had, such as in making promotional microsites (Yahoo has built a fair amount of Tumblrs for new movies), but the core proposition is that Tumblr advertising is presented to the logged-in Tumblr user in the Tumblr dashboard. Which means, of course, that you need to convert more people into regular users of the Tumblr dashboard. And one big way to do that is to get a lot of quality content into the Tumblr system. Right now, though, Tumblr doesn’t have the full buy-in from the big professional content producers. The amount of effort that, say, the New York Times puts into producing for Tumblr vs. Facebook, etc. is revealing. In part this is because Tumblr doesn’t cultivate those orgs. Rather, the focuse for the past few years has been on bringing more brands into the Tumblr system. Given Yahoo’s mandate that Tumblr bring in revenues of $100 million in 2015, — which, well, how’s that going, anyway? — it is understandable that Tumblr’s focus these past few years has been around cultivating brands to use the platform. But brands are, at best, imperfect content creators. It’s no surprise that places like Facebook, Snapchat and Twitter are working hard to figure out ways to entice professional content creators to use their platforms. Right now, Tumblr doesn’t have anywhere near the incentives that those players do, and Yahoo isn’t helping. But Yahoo can help. If it embraces Tumblr as a content platform. If it produces great use cases that show others the real value and potential there. And if it develops revenue sharing programs for partners that give them a financial stake in game.